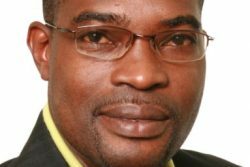 Embattled Deputy Director of Prisons Gladwin Samuels yesterday insisted that he did all he could to safeguard the lives of the Camp Street Prison inmates on March 3rd, when 17 of them died, and suggested that prisoners would be hard-pressed to give a true account of the events due to fear. Testifying before the Commission of Inquiry (CoI) into the fatal prison fire, Samuels said those who knew him, including prisoners, and who were willing to speak the truth would give a totally different account of his operations at work but may be reluctant to do so because of the prison culture. “…There are persons in the prison who are aware of what happened on that day, but they cannot come and say it because either when they get back to the prison they are gonna be what we call “sorted out,” or sometime down the road—because if you check our rate of recidivism, there’s a likelihood of them returning to prison—if they’re not beaten now, they will be beaten then, or they will be viewed as what is called ‘cochore,’” he said. Under questioning by Joint Services attorney Selwyn Pieters, who led the examination yesterday, he denied reports made by most of the prison witnesses that he passed an order to lock the door and “leh they burn and dead,” offering that he would never state such, particularly in a prison environment. He said the situation was very devastating to him, revealing that he relives the experience on a regular basis. After the events had unfolded that day, even before he had learned of the deaths of the 17 inmates, Samuels said prisoners had begun complaining to Assistant Commissioner of Police Clifton Hicken that he was responsible for the fire and had passed an order for the door to be closed. To minimise conflict, Hicken suggested he leave the prison yard, to which he complied. Based on allegations made against him by the prisoners, he was sent on leave after the fire. Samuels said that the untruths being reported and the picture that has been painted in the media, based on accounts from prisoners of him being “barbaric,” has had major effects on not only him but his family. He related that when making trips to places like the bank and supermarket, or simply driving on the street, persons look at him differently. “Operating in a prison environment is a very unique opportunity, and the fact that I would have demonstrated over a number of years what I would refer to as excellent leadership qualities, and even on the day of the incident, knowing that I did all that was possible in order to safeguard the lives of the prisoners, especially an additional 64 prisoners who were in Capital B being held—what I would want to consider hostage—and then to be peddled in the media and to be described by prisoners as this barbaric person, that basically affected me a whole lot,” he added. Deputy Director of Prisons Gladwin Samuels demonstrating to the tribunal how the locks at the prisons operate. The hostage situation Samuels referred to was the alleged disposition of the inmates located in Capital B, when prison officials had initially attempted to have the division evacuated on March 3. 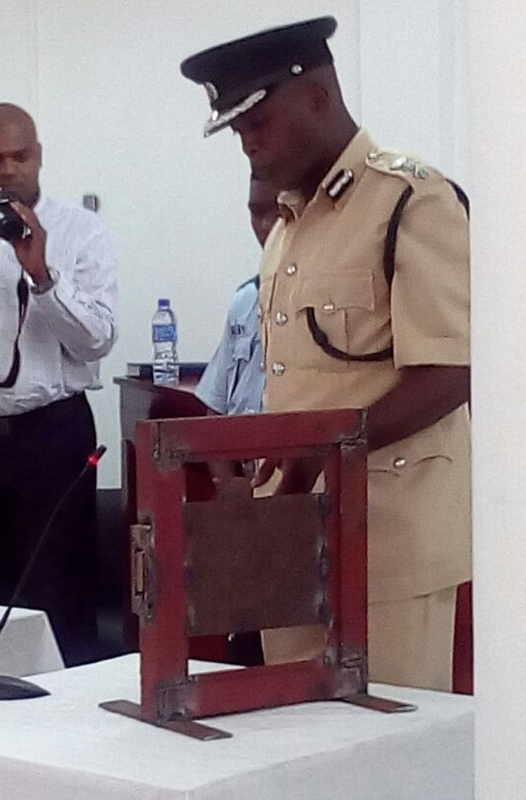 Following the testimonies of prisoners who claimed to have seen Samuels wielding a gun on the day of the fatal fire, the officer yesterday testified that his gun was drawn to safeguard his life, the life of the prison officers and the inmates in that division, who he deemed to have been taken hostage by another prisoner. The prisoner in question was Jermain Otto, who Samuels said had been standing in the doorway to the Capital B division, face partially covered, and hurling threats. The prisoners housed in Capital B were standing behind him and had been reluctant to exit the dormitory, allegedly reporting that they were receiving threats from the prisoners in the adjoining Capital A dorm. He stated that a conclusion had been drawn by him that Otto, a resident of the Capital A division, had entered the nearby dorm through the hole the inmates had created in the wall separating the two dormitories. He said the inmates eventually exited, at which point a fire was seen at the hole between the divisions, which was put out by wardens using fire extinguishers. He related, however, that as they had tried to put it out, inmates continued to throw mattresses at the fire, but it was eventually brought under control. Samuels stated that soon after relating to ranks that whoever was found in Capital B would be deemed “illegal,” he saw what appeared to be a fire in Capital A. He then passed an instruction for the door to that dorm to be opened so those who wished to come out could, but was told the door was not opening. According to Samuels, he then passed an order for the door to Capital B to be reopened so they could exit through the hole created in the wall, but when he saw thick, black smoke and flames begin to flow through the grills, and realised the door to A was still locked and no one had come through the B dorm, he instructed a civilian employed there to cut through the door. He related that this attempt failed, as the heat had been too intense at the time. A pump belonging to the prisons was then engaged to direct water to the block but issues arose with the connection. A Fire Service hose was, however, soon set up in the compound, and was used at first on the door to the division to provide cooling. He said that after numerous efforts, the door was eventually opened by prison officers. Samuels also denied claims that tear gas was used in the building, after prisoners had testified to seeing someone dressed in a task force uniform throw two canisters into the room after the fire was extinguished. 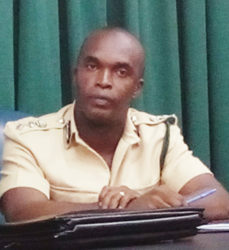 Samuels, who was said to be dressed in a white prison service t-shirt, blue jeans, and brown shoes, refuted all claims that he had been in the yard at the beginning of the search, leading the task force. 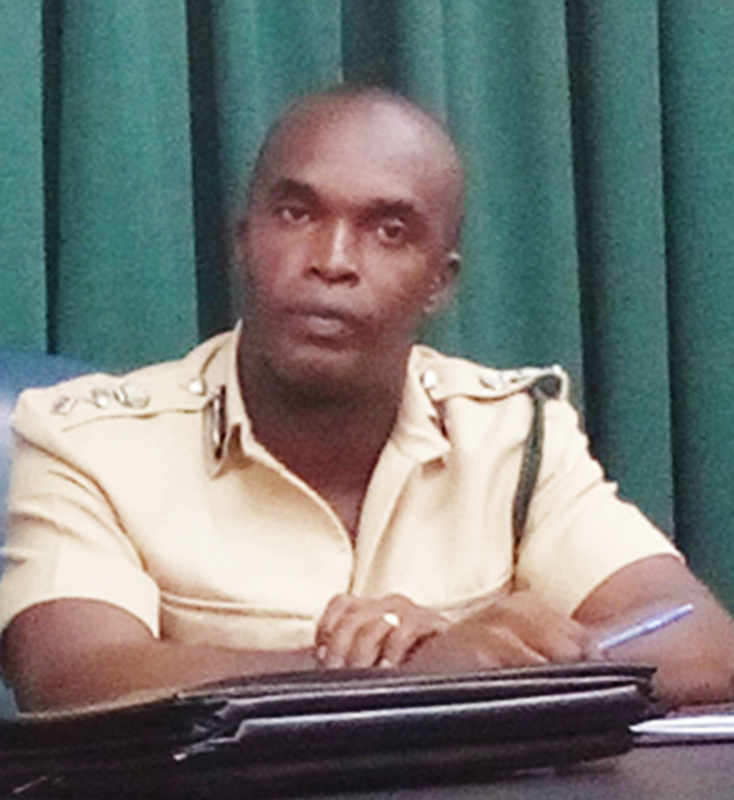 Just as Samuels had arrived on the scene on March 3rd, he said he witnessed the task force in action as they carried away inmate Collis Collison during a routine search. According to his testimony, he had just traveled back from Bartica, after making a visit to the Mazaruni prison, where he had been on the first day of the unrest, March 2nd. 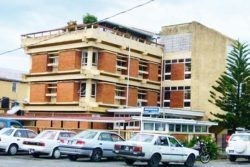 Samuels’ returned to Georgetown reportedly on a request from the Director of Prisons, Carl Graham, who informed him on the morning that he had a major plan in place to assess damage done to the prison on the night before, identify ringleaders and have metal beds removed from the dorms. On scene at Camp Street, he said he saw Collison, though restrained, behaving in a hostile manner. He took a digression from recalling the events on that day to mention that he has known Collison for quite some time, stating that while incarcerated at the Mazaruni prison, he had been a known ringleader. He explained that Collison would stand out among prisoners because of his reputation, having been in and out of the system for various offences. He had been greeted by noise and as soon as he entered the prison yard, and following the encounter between Collison and the officers, he could hear banging, the sound of metal on metal, and what he recognised as the sound of the wall between the two divisions—Capital A and B—being tampered with. Recognising the high threat this situation posed and the need for the “beefing up” of security, he ordered three prison officers to retrieve guns and ammunition, including his own firearm, none of which were used that day according to him. He noted that at this point and in keeping with the Standing Orders, the aim was to prevent the location from being overrun as the property they were ordered to defend was under attack. Samuels will appear again before the Commission today, when he will be subject to cross-examination.